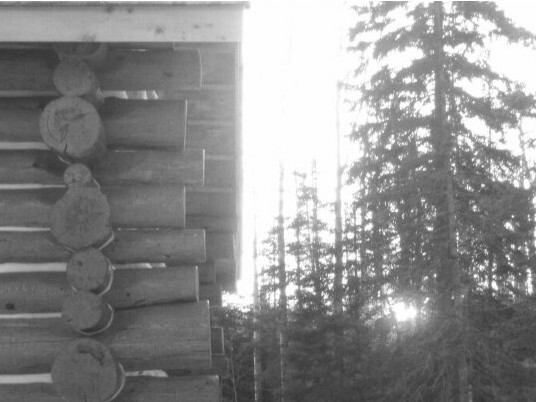 My adventure started in earnest during 2002 when I began building my handcrafted log lodge. I have always dreamed of having a bed and breakfast to pamper new and old friends in the process. The hard work is underway. Please follow my progress and plan a stay to experience what I lovingly call "Raspberry Ridge Bed and Breakfast". Yes free range chickens did come to Raspberry Ridge. It is amazing to me that it's already been a year since I brought the little fluff balls into their new home. They were parked next to my bunny Thumper's hutch and there they stayed for a considerable time as the weather of 2013 was nearly as harsh as this winter of 2014 has proven to be. Now, they spent their days and nights in their well insulated chicken coop with a 250 watt heat lamp keeping them comfortable in the bitter cold temperatures that with wind chills have frequently hit the -30 below mark and on several evenings embaced -50. I give them extra protein during the winter months and there is no coaxing them out of their warm coop except on the rare day the temperatures rise above 15. My flock is happy and healthy in their little world. I feed them organic grains, wild harvested fruits and preserved organic vegetables from my garden. There were many sunflower heads that they got to while away the hours pecking to get the seeds pulled from the dried sunflower head. coming weeks. My beautiful sweet Buff Orpington has gone broody and she is as of today straddled over nine eggs. A quick inventory today showed that she is sitting on about five of her own, there are a couple of my Black Star hens eggs as well, a couple of Easter Eggers and even one Rose Combed Brown Leghorn egg. The father of this brood is Manny, my Blue Laced Red Wyandotte. The chicks will be farm chicks... and they will be sexed and I will keep the hens and see how many roosters I will have to try to rehome. My rooster is a rooster like none I will see again. He does such a superb job of caring for and looking out for the hens that I don't want to see another rooster disrupt the harmony which he has brought to this little band of sisters. There will most certainly be news to share when the happy new arrivals find their way onto the scene. It's going to be a very special day when I open the door to greet the flock and see Fluffy protectively harboring fluffy baby chicks peeking out from under Fluffy's breast. Spring is on it's way at Raspberry Ridge, whether Old Man Winter wants to ease his grip on us or not.